If you’re newly engaged, a huge congratulations from both of us to both of you! We would love to help you plan your wedding smartly, with both style and savvy. Today, Steph (also newly engaged!) 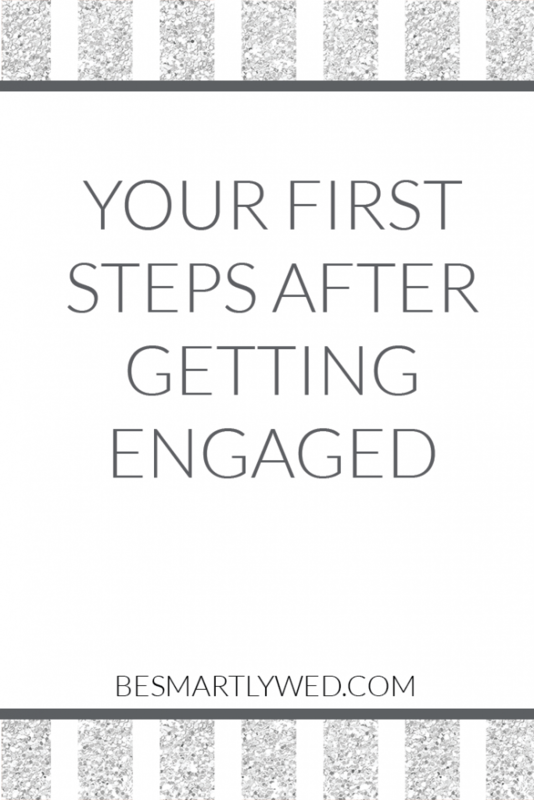 is bringing you her tips for what to do after your engagement in order to start your planning process on solid, not stressful, ground. We are planning for a fall 2019 wedding, so I’ll be walking you through my planning process over the next year. 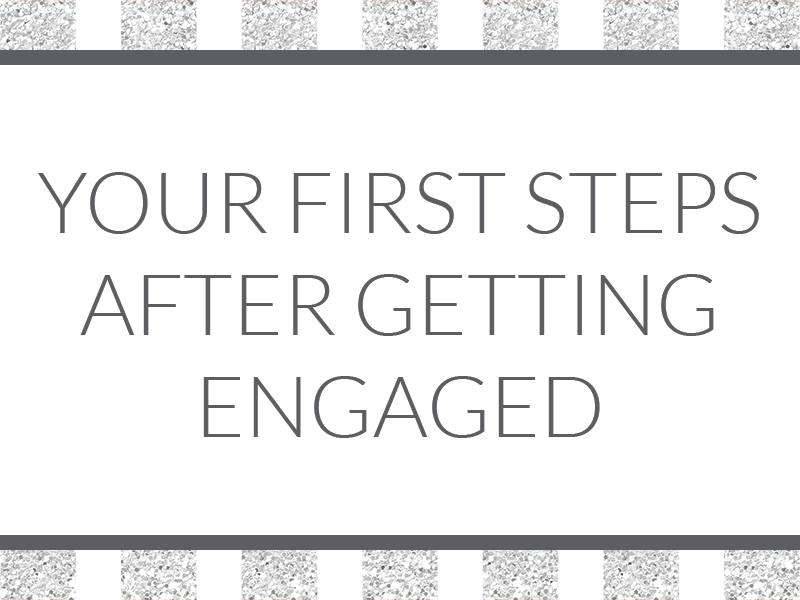 In the meantime, here are a few tips to help a newly engaged bride-to-be! B and I got engaged at home on a Friday night. It was a wonderful surprise and I didn’t react the way I always imagined I would – let’s just say there was a LOT of tears. We spent the night calling our families and a few friends with plans to finish off the calls on Saturday since it was getting late and we didn’t want to wake anyone up. Saturday morning, I woke up to several text messages congratulating us on our engagement. I was so confused as to how these people knew but quickly realized one of my best friends posted about it on her Facebook page. I called her and asked her to take it down, as we hadn’t told most people yet. It was an innocent mistake, she was extremely apologetic, and I didn’t make a big deal out of it. We still could tell most of our closest friends ourselves. Your friends and family will probably be excited to tell everyone the news, so make sure they know your plan for sharing it. If you are going to publicly share the news – great! If you are planning on doing personal announcements, make sure those in the know understand that it is still a secret and to keep quiet about it until you and your fiancé can share the news yourselves. If you do have a few spill the beans, remember that they are doing it from a place of love because they are excited for you and your fiancé. They really don’t mean any harm! Are you going to share the news with everyone yourselves, or are you going to ask your family / friends to help? Would you prefer to tell people in person, call them, or send an e-mail? It may make sense to do a combination of these. Do you want news of your engagement kept off social media? If not, are you okay with others posting, or would you two prefer to do the posting? Will you be upset if a family member hears the news and tags you in a congratulatory message? If so, how might you take steps to prevent that? While B and I have been together for over eleven years now, we hadn’t ever really talked about our wedding goals. B was happy to enjoy spending time celebrating our engagement while I wanted to get right down to planning as I know how far out good venues can book. He thought I was a little crazy for jumping right in and asking him so many wedding questions twelve hours after we got engaged. In fact, it completely overwhelmed him. B and I then talked about what our main goals were for our wedding. At first, he didn’t want to be very involved, but that changed after I started touring venues and he realized that he wanted to be included on those decisions. Have a discussion with your fiancé about how you want to handle planning. Do they want to be heavily involved? Would they rather you just tell them details later? How long of an engagement do they want? Discussing some of these topics right off the bat will save you a lot of time and frustration later, especially if wedding planning isn’t something that particularly interests them. Like B, they might change their mind after you start and either want to be more or less involved, which is okay! From Kim: I knew I had the comparative advantage in researching wedding venues and vendors, and I enjoyed that part of planning much more than S did. He and I decided that I would do the initial research, pick a handful of options worth discussing, and then we’d narrow down to the 3-5 in each category that appealed most to us. We were both fully involved in the decisions, but my taking the lead on research worked for us. The morning after getting engaged, I brought a huge basket of Martha Stewart Weddings and The Knot magazines down into the living room. I immediately dug in and began looking through an issue. Almost instantly, I became overwhelmed. All I could think about was all the massive (and expensive) decisions we were going to have to make and started panicking. I called Kim, who reminded me that everyone would be ok (thanks, sis!) She told me to start with the budget and go from there. Once I talked to B about our budget, many things became easier to handle. Suddenly, venue hunting wasn’t as daunting since I knew how much we wanted to spend on it. If it was out of our price range, I stopped looking there and could easily narrow down my list. Check out our posts on this subject! While it can be thrilling to start planning immediately, I wish I had taken more of a breath to enjoy our engagement before worrying about the details of the wedding. We were fortunate enough to celebrate the day after with B’s brother and sister-in-law since we already had a dinner scheduled before we got engaged and could celebrate with some friends in the first week. I wish my schedule and my anxiety had let me relax more in the early days of our engagement (I’ve already had dreams of someone stealing our venue before we could sign the contract!) instead of booking venue tours. Celebrate! You’re going to be surrounded – whether physically or emotionally – with well wishes, so be sure to take some time for just the two of you: make reservations at a favorite restaurant, open a special bottle of wine, cook a special meal at home, visit a sentimental location, whatever you enjoy! What did you do first after getting engaged, and is there anything you wish you’d done differently? What advice would you give to someone starting the planning process? Leave us a comment below!